A Dutch expert brought in to oversee the reform of the Scottish Fingerprint Service has criticised the mindset at all levels of the organisation. Arie Zeelenberg said people in the service had put self interest before justice in the Shirley McKie scandal. In a new report to the parliamentary inquiry he also dismisses those experts who maintain that no mistake was made. Earlier this year the former Strathclyde Police detective was awarded £750,000 compensation over the mistaken identity over her print in 1997. Ministers called the misidentification an "honest mistake". 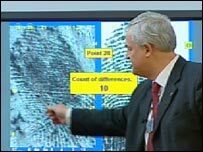 Mr Zeelenberg, senior fingerprints advisor with the Dutch National Police Force, was hired by the Scottish Executive to oversee the reforms of the Scottish Criminal Records Office's fingerprint bureau brought about by that misidentification. In new evidence to the inquiry being carried out by Holyrood's justice committee, he identifies poor management within the fingerprint service, which he said reacted defensively with an eye of self interest. He said justice and truth were secondary considerations. Mr Zeelenberg said the misidentification arose from the same sort of mindset or tunnel vision which caused miscarriages of justice in recent cases in America and the Netherlands. The expert, who has already made a presentation to the justice committee, has now submitted an additional report to the MSPs. In that he states: "The management of the case by all levels involved is very poor to say the least. "Simply said, this case should never have taken nine years to resolve. "It is up to the committee to investigate the causes but it is my opinion that all that were involved in managing, when confronted with the case have all acted almost instinctively, reactive and defensive with an eye on self-interest and short-term damage control. "Justice and the truth were second to that." The four experts involved - Hugh Macpherson, Fiona McBride, Anthony McKenna and Charles Stewart - still maintain the print was made by the former policewoman. They have complained First Minister Jack McConnell "sold them out" and Eastwood Labour MSP Ken Macintosh, who represents three of them, claimed the Scottish Executive had left them "high and dry".